Shabach Ministries International - Equipping kingdom citizens for a global impact. 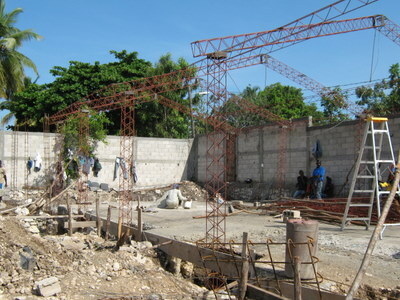 At the beginning of March the Haitian Government issued a ban on all schools with concrete roofs. The ban is still in place and it is unclear how long it will last as it was prompted by the frequent tremors that continue to shake Haiti. 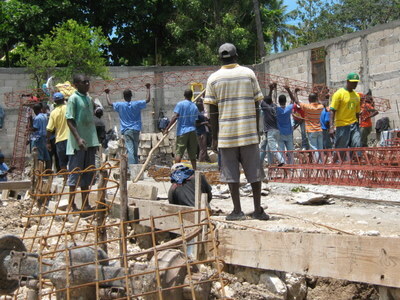 At the same time the Haitian government asked any schools that were able to reopen to do so by the beginning of April. In response to this request and honoring the ban, Shabach Ministries International (SMI) has begun constructing a new school campus. Although it is not yet complete significant progress has been made. The new structure will be built primarily out of steel and will hold 12 classrooms with the potential to add a second story. The goal was to have construction done by the beginning of April, however, limited funding has required that more time be taken. Classes will begin as soon as this school is completed (supplies will be transferred from the existing but inoperative school building at SMI's main campus). To donate to this project click HERE. Repairs on the existing concrete school building at SMI's main campus will begin as soon as the government lifts it's ban and the funding comes in.